We are a provider of sameday delivery services for anything from a passport or a set of keys right through to multiple pallets with a total weight of up to 1,200Kg. We handle any kind of goods, with the exception of dangerous goods (known as ADR) and livestock. We collect and deliver across the UK mainland, and beyond by arrangement. We serve everyone from members of the public looking to move small items from one place to another (we've handled a pair of spectacles, a wedding dress, a Welsh Dresser, passports, sets of keys right up to student moves). 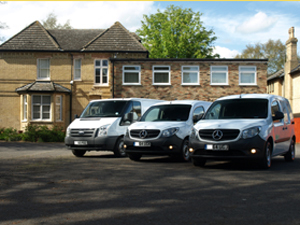 We also provide delivery services for a number of businesses based in Huntingdon, Papworth Everard, St Ives and St Neots. These companies are now saving 20-30% when compared to their previous courier arrangements. Our service is appreciated far and wide; we even have a customer in Wrexham, 145 miles from our base in Huntingdon. Our customers experience on-time deliveries; out of 1,200 jobs undertaken, all have been delivered within 1 hour of the original delivery estimate and with ZERO damage incurred. One customer previously using a major courier company was experiencing damage in over 5% of deliveries. Our customer testimonials confirm this positive user experience.